A fascination with accidents and medical fetishism are the basis for Romain Slocombe's body of work. 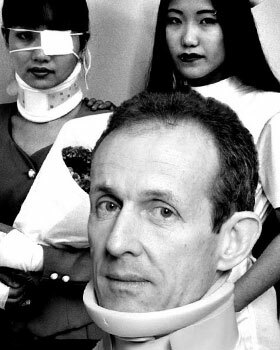 His photographs and paintings of injured Asian women have become so iconic that he has almost monopolized the genre. - Chronological list of books published with Romain Slocombe's art. Divided by genre. - Biographical information about Romain Slocombe - including education, exhibitions, publications, professional milestones, and more. Books and other goods featuring the art of Romain Slocombe for sale on AkaTako.